Three weeks prior to my trip to Nicaragua I bruised the left side of my ribs pretty seriously. To the point I had them x-rayed to make sure they were not broken. This injury really put my trip in jeopardy. The Ergo works, period! After I was injured, I was completely stressed I had turned my surf trip into a fishing trip. By doing some research, I came across the Ergo and immediately went to Bird's Surf Shed to buy one. Bird had nothing but great things to say about the Ergo because he had used it on a surf trip with a cracked rib and it saved his trip. I've had injured ribs in the past and can say even if they feel better, paddling on a surfboard can easily re-injure them setting your healing back weeks. During this recent injury I had to stay out of the water for the three weeks doing hot and cold compresses 5 to 10 times a day, just so I could have a chance at surfing. It was the moment of truth when I got down there. Without a doubt, had I not had the Ergo, there would have been no way I could have surfed more than 20 minutes without re-injuring myself. 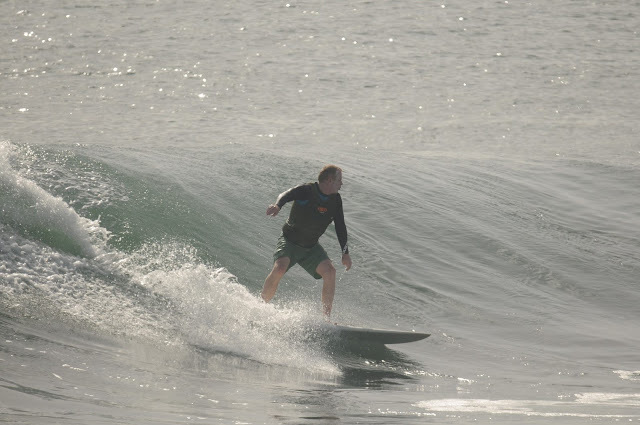 Instead, I surfed 2 to 3 times a day for several hours each day. So thank you for your inventiveness and ingenuity. It really saved my trip. I also have to tell you everyone I ran into was very curious about what I was wearing. Most thought it was for floatation, but once I explained what it was they were really intrigued by it. The surf instructors mentioned how a lot of beginners get sore ribs after day one and need some time out of the water before they can do it again. They were all interested in getting a few for their camps, so people could spend more time in the water. If you haven't already, get in touch with some surf camps and maybe you could move a few more units. Thanks again your newly satisfied customer. Get your own Ergo from your local surf shop or online at PaddleAir.com. Surfing means a great excitement to me. That's is really a favorable pleasure all the time.